We’d love your help. Let us know what’s wrong with this preview of Rettie and the Ragamuffin Parade by Trinka Hakes Noble. To ask other readers questions about Rettie and the Ragamuffin Parade, please sign up. I knew nothing of the Ragamuffin Parade in NYC. My mom often called me a ragamuffin growing up when I dressed crazy, yet I didn’t really know the context. The author’s note also theorizes that this Ragamuffin Parade could also have been a spark for the start of the Thanksgiving parade as many of these children in the parade ended up working at Macy’s. This is interesting… for adults. The niece and the nephew are really into history. My nephew is into robots, monsters and weird stuff, while my ni I knew nothing of the Ragamuffin Parade in NYC. My mom often called me a ragamuffin growing up when I dressed crazy, yet I didn’t really know the context. The author’s note also theorizes that this Ragamuffin Parade could also have been a spark for the start of the Thanksgiving parade as many of these children in the parade ended up working at Macy’s. This is interesting… for adults. The niece and the nephew are really into history. My nephew is into robots, monsters and weird stuff, while my niece is into, it’s anyones guess day to day. I think this is a good story with a nice story to tell, but it takes the special child to appreciate the value of this story in my opinion. Rettie’s mother is sick and that is a scary subject in our house, so the book didn’t sit well. The kids gave it low ratings. If your kids are into knowing about the past or history or stories with layers, this could be a great story for them. This covers the Ragamuffin Parade of 1918 and the Great Influenza attack. It’s not an easy story, but it turns out ok in the end. Loretta Stanowski, known as Rettie in her neighborhood, lived in the tenements of New York City's Lower East Side in 1918. With her father away fighting in World War I, and her mother sick with consumption, it fell to nine-year-old Rettie to take care of the home, and of her three younger siblings. Determined to make ends meet, Rettie looked forward to the annual Thanksgiving Day "Ragamuffin Parade," in which the poor children of the city were allowed to march the streets, asking for pennies and Loretta Stanowski, known as Rettie in her neighborhood, lived in the tenements of New York City's Lower East Side in 1918. With her father away fighting in World War I, and her mother sick with consumption, it fell to nine-year-old Rettie to take care of the home, and of her three younger siblings. Determined to make ends meet, Rettie looked forward to the annual Thanksgiving Day "Ragamuffin Parade," in which the poor children of the city were allowed to march the streets, asking for pennies and other treats. This year, however, the terrible influenza outbreak threatened to put a stop to the parade. What would Rettie do, if she couldn't get those all-important pennies...? Being in the Ragamuffin Parade is simple enough, too. All kids have to do is walk down Broadway on Thanksgiving morning and people will toss pennies to them. O It's Fall 1918 and the kids living on the Lower East Side in NYC are getting excited about the upcoming Ragamuffin Parade, especially Loretta "Rettie" Stanowski, 9. 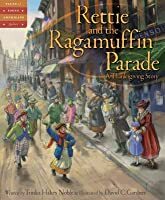 All you need to do to be in the Ragamuffin Parade is to dress up like a beggar, and Rettie certainly has enough ragged clothes to do that, right down to the holes in her shoes. This story takes place in 1918 when the influenza was rampaging through America and World War I was coming to a close. Rettie lives in lower Manhattan and must take care of her family while her mother is sick. Wishing to make this Thanksgiving special and boost the spirits of her siblings, she counts the days until the Ragamuffin Parade. **Like my reviews? I also have hundreds of detailed reports that I offer too. These reports give a complete break-down of everything in the book, so y This story takes place in 1918 when the influenza was rampaging through America and World War I was coming to a close. Rettie lives in lower Manhattan and must take care of her family while her mother is sick. Wishing to make this Thanksgiving special and boost the spirits of her siblings, she counts the days until the Ragamuffin Parade. This is a gorgeous book, a wonderful telling of time and place, and a thought-provoking message about just how easy we have it in our modern lives. Set in the slums of NYC in the World War 1 era, we read of young Rettie's selfless dedication to her family and her determination to give them a nice Thanksgiving. Look closely for a tiny kitten who wanders throughout the pages, a ragamuffin herself, who eventually finds a loving home in Rettie's household. This is indeed based upon fact--even the mo This is a gorgeous book, a wonderful telling of time and place, and a thought-provoking message about just how easy we have it in our modern lives. Set in the slums of NYC in the World War 1 era, we read of young Rettie's selfless dedication to her family and her determination to give them a nice Thanksgiving. Have you ever heard of the Ragamuffin parade? I had not until I read Noble's book. Life was hard in 1918 New York City. Rettie’s papa was fighting in the war and influenza was sweeping the country. Rettie’s mom was sick (bur fortunately not with flu) so it was up to nine-year old Rettie to take care of her two younger sisters and baby brother. She cooked, she cleaned, and she washed rags for the rag picker. Rettie sets her hopes on the annual Ragamuffin Parade so she can gather up a few extra pe Have you ever heard of the Ragamuffin parade? I had not until I read Noble's book. Life was hard in 1918 New York City. Rettie’s papa was fighting in the war and influenza was sweeping the country. Rettie’s mom was sick (bur fortunately not with flu) so it was up to nine-year old Rettie to take care of her two younger sisters and baby brother. She cooked, she cleaned, and she washed rags for the rag picker. Rettie sets her hopes on the annual Ragamuffin Parade so she can gather up a few extra pennies and make this year's Thanksgiving extra special. Loretta "Rettie" Stanowski always looks forward to the ragamuffin parade and the pennies that she will get there - pennies that will help her family. Children dress up in rags and parade down the street. Rettie hopes the parade won't be canceled with flu spreading through New York City. Noble's text and Gardner's illustrations really capture the flavor of life in the tenements of New York City's Lower East Side. Read the fascinating author's note for the connection to Thanksgiving. The author does a good job weaving historical facts into this Thanksgiving story. One where readers will learn about the 1918 influenza pandemic, the poverty found in tenement life in New York, and the Ragamuffin parade (something I'd never heard of) that brought hope to children & struggling families. Click here to place a hold on this book in the library catalog. The author did a great job combining historical facts about the 1918 influenza pandemic, tenement life in New York City, and the Ragamuffin Parade (something I wasn't aware of) into this thanksgiving story. I had never heard of the Ragamuffin Parade, which this story is built around. Rettie is a young girl in 1918 who takes over the responsibility of supporting and taking care of her brothers and sisters while her mom is sick and her dad is fighting the war in Europe. She's hardworking and likable. The author does a good job of weaving historical facts into this Thanksgiving story. One where readers will learn about the 1918 influenza pandemic, the poverty of tenement life in New York, and the Ragamuffin parade (something I'd never heard of) that brought hope to children of struggling families. Heartbreaking, Sad, Teaches an important lesson hopefully to the children who read the entire book. Poignant story gorgeously illustrated about the ragamuffin parade in NYC in 1918. Interesting author note follows. Very interesting. A good story for all. While loosely connected to the Thanksgiving holiday, this is better just as a really good piece historical fiction for younger children. Linked to World War I, the Ragamuffin Parades of New York and the 1918 influenza epidemics, it tells a touching story about a little girl forced to take care of mother as well as her younger siblings. I had never heard of the Ragamuffin Parade, or its connection to the later Macy's parades, but that part alone would have made a cool story. Placing the whole thin While loosely connected to the Thanksgiving holiday, this is better just as a really good piece historical fiction for younger children. Linked to World War I, the Ragamuffin Parades of New York and the 1918 influenza epidemics, it tells a touching story about a little girl forced to take care of mother as well as her younger siblings. I loved this story about a resilient little girl who cares for her family while her mother is ill and her father is away fighting in World War I. The illustrations were beautiful!